In Egyptian mythology, gods were considered heroes. In more modern times, it is men who are the heroes. Without a doubt, General Gamal Abdul Nasser has secured his legacy as a hero – a revolutionary who fought for Egypt and strived for Arab unity against Israel and Western imperialism. This month marks the 50th anniversary of the 1967 Arab-Israeli war; a pre-planned war of aggression and expansion by Israel against Egypt, Jordan, and Syria, aided by the US and Britain. Israel’s cronies assisted in the planning and execution of the war which led to the seizure and occupation of East Jerusalem, the West Bank, Syria Golan (Golan Heights) and the Sinai Peninsula. Prior to the start of the war, as early as May, Lyndon Johnson who assumed the presidency after the tragic assassination of JF Kennedy, authorized air shipment of arms to Israel . Furthermore, the United States facilitated Israeli air attacks and advances by sending reconnaissance aircraft to track movement of Egyptian ground forces and American spy satellites provided imagery to Israel . According to reports American and British carrier-based aircraft flew sorties against the Egyptians and U.S. aircraft attacked Egypt. Judging by their cover-up, the American leadership had as little compassion for American blood as it did for Arab blood. The Israeli attack against USS Liberty that killed and injured American servicemen was buried in a sea of lies. Fifty years on, the war rages on and Israel has a different set of cronies. In sharp contrast to Nasser, el-Sisi, Egypt’s antihero has thrown his lot in with Israel and Saudi Arabia against his Arab brethren. 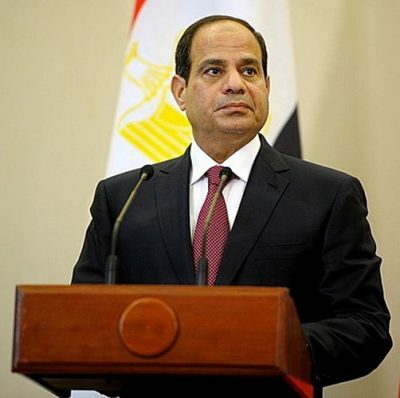 El-Sisi’s betrayal has been so outlandish and stark that even the neocon leaning New York Times published a scathing article titled: “Egypt’s Lost Islands, Sisi’s Shame” by Adhaf Soueif. This is a remarkable piece rarely seen in the pages of the NYT given its reputation (see LOOT for example). Soueif rightly calls el-Sisi’s to task for handing over the Tiran and Sanafir Islands at the mouth of Gulf of Aqaba to Saudi Arabia. More telling is the fact that the transfer had been discussed with, and had received the blessings of Israel, according to Israel’s Defense Minister Moshe Yaalon. The implications of an Israeli-Saudi-Egyptian alliance are enormous; though hardly the first act of treason by el-Sisi. In his article Soueif also touches on the dam being built by Ethiopia (the Grand Ethiopian Renaissance Dam) which was opposed to by former President Mohamed Morsi who was ousted in a coup by el-Sisi. It is crucial that this project be further explored as it relates not only to Egypt, but also the past and future politics and geopolitics of the region. Before moving on however, it is important to recall that Morsi was democratically elected to office in the aftermath of the Egyptian ‘revolution’. His support of the Palestinians and his opposition to the dam did not sit well with Israel. Morsi had even called “Jews descendants of pigs and apes”. Both HAMAS and the U.S.-backed Palestinian President Mahmoud Abbas welcomed Morsi’s election. Abbas called Morsi “the choice of the great people of Egypt” while one of his senior aides, Saeb Erekat, said the democratic vote for Morsi “meant the Palestinian cause was the Number One priority for all Egyptians“. 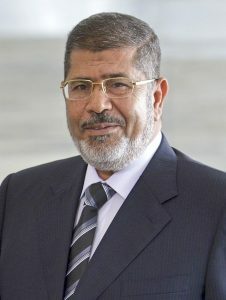 Though perhaps the greater concern for Israel was Morsi’s opposition to the construction of the dam. A construction favored by Israel and Saudi Arabia. On May 30, 2013, The Times of Israel reported that the construction on the Grand Ethiopian Renaissance Dam (on the Blue Nile) had sparked a major diplomatic crisis with Egypt. The article also reported (citing Al-Arabiya) that Major General Mohammed Ali Bilal, the deputy chief of staff of the Egyptian Armed Forces, had said Egypt was not in a position to confront the project (countries). No such solutions from the U.S.
“Imagine what 80 million of us would do to Israel and America if our water was turned off”. With el-Sisi’s “democratic coup” which was handsomely rewarded, the dam project is on schedule to be completed by year’s end. As Israel has expands and accelerates its wars of aggression, the wider implications of el-Sisi’s will reverberate throughout the region as serve-serving Arab leaders fight their own to execute Israel’s agenda. Soraya Sepahpour-Ulrich is an independent researcher with a focus on U.S. foreign policy and the influence of lobby groups. “Will Nile water go to Israel? North Sinai pipelines and the politics of scarcity”, Middle East Policy (Sep 1997): 113-124.